Woman to Woman: Which Would You Rather Be - A Young Wife or A Wise Wife? Which Would You Rather Be - A Young Wife or A Wise Wife? Let's play a little game. If you could choose to be only one, which would you choose - a young wife or a wise wife? I got married one month shy of my 32nd birthday. I'm not too sure if I'd consider myself wise, but I do think I was wiser than I was in my early twenties. Now I am 38 years old. I have been married six years and have a toddler. However, do you want to know a little secret? I'm still envious of young brides. Anytime I hear of a young woman in her twenties getting married, I secretly wish I were her. You see, that's what I wanted for my life. To go to college, get married, and have four babies. Yes, four. My life was all planned and tied nicely with a bow. Now, even though God answered my prayers for a husband and a baby, I still find myself mourning the life I planned. This month I am hosting a 31 days series on my blog called, "31 Days of Interviews with Single Women Making a Difference." Wow, the interviews are good! If only I had these single women's maturity, wisdom, and security in Christ when I was single. I would have saved myself much heartache and been better prepared for marriage. But I digress . . . I read that last sentence and paused. Conviction set into my heart. I didn't concentrate on being a wise wife when I was single. I wanted to be a young one. And even now I spend my energy thinking about what could have been instead of how to grow in wisdom. I think that if I asked single women in their early twenties this question, they would have a hard time answering it. Sure, they know the right answer. They want to say they would rather be a wise wife. But I think deep down the truth would be they would rather be young. For young women the thought of getting married older, no matter how much wisdom comes with it, is often terrifying. We can handle getting married in our early 30's but what about in our late 30's or even 40's? Would you choose wisdom over youth then? This is where we get ourselves in trouble in relationships. Fear is so often the catalyst for poor decision making. It was for me. When I was in my twenties, and as I approached my 30's, I was scared of never getting married. I was scared of never having a baby. I imagined looking into my future, and all I saw was blank space. There was nothing there, and I didn't know what would fill it. My fear caused me to focus on getting my needs met instead of becoming the woman God wanted me to become - a woman of wisdom. I dated guys I shouldn't have dated. I continued to date guys I shouldn't have continued to date. I even had crazy thoughts like, "Well, if I can just get married then I will 'have him' and I can work all the kinks out later." This thinking is so naive and dangerous. Your goal as a single woman should be to grow in wisdom, not to find a husband quickly. And you should look at each passing year as one more opportunity to make that happen. Proverbs 14:1 says, "The wisest of women builds her house, but folly with her own hands tears it down." You may not be married yet, but you are already building your house. We think that the choices we make today will not affect the future, but nothing is further from the truth. Today I deal with situations in my marriage that are a result of not becoming a wise woman when I was single. Proverbs also tells us, "She is clothed with strength and dignity, and she laughs without fear of the future" (Proverbs 31:25, NLT). When we're fearful of the future, we cannot laugh. We cannot enjoy the life God has given us now. Our strength and dignity wane because our eyes are on ourselves and not on God. We become desperate to get our needs met, and our desperation leads to destruction. Today, what will you choose? 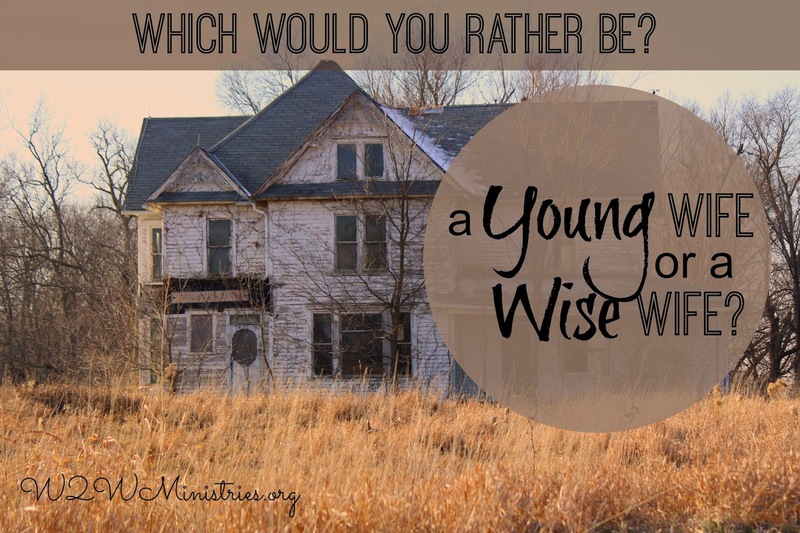 Will you choose to work at becoming a future wife of wisdom or a young wife? Will you start building your home now, or will you begin the process of tearing it down? Will you look at your future with joyful expectation of being a wise wife, or will you look at it with fear? I pray you choose wisdom. There are far more benefits in being a wise, older wife than a unwise, younger one. Share with us! What would you choose? A young wife or a wise wife? Thanks for this encouragement! I was one of those young (and foolish) wives, but now rather than focusing on the wisdom God is granting as I grow in Him, I tend to look back longingly at my younger years. I needed this admonition. Sharing on my blog's FB page! Jennifer, I can relate. I find it so disturbing that I look back to those days with fond memories when they weren't fond. It's like when Lot's wife looked back at Sodom and Gomorrah. There's something that's causing me to look back that I'm trying to figure out. This is what I always wanted - husband and children - but I still look back. A good, thought provoking post! I was a young bride, and like Jenifer Metzger, I'm still learning everything. I agree with you though, some focus on getting married by a certain age, and once when we reach that we're off the market. Marriage is something that we should do, if we are called to do it. It's not easy, and it takes work. The wedding is not the end of the story, it's the beginning.